Review: Taking well-known, and well-loved songs, and submitting them for a remix treatment can be a risky prospect. There are those who cherish the originals and cannot bear to hear any other version than the definitive first one. There are remixes that can miss the meaning and heart of a track, leaving an incoherent mess that doesn’t flow. There are remixes that are nothing more than ramping up the drums’n’bass, adding a techno beat and looping the odd lyric. Then there are remixes that make you sit bolt upright and re-assess the songs you know so well and hear them in a new way, maybe even picking up on the significance of lyrics that you know but never fully grasped. 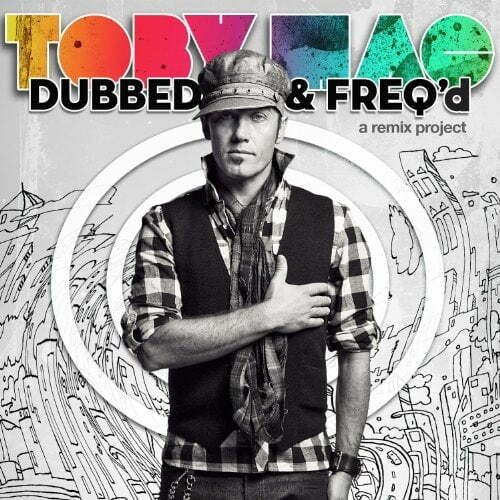 For TobyMac fans a remix project is an exciting prospect, especially following the previous remixes of the “Momentum” and some of the “Portable Sounds” albums. 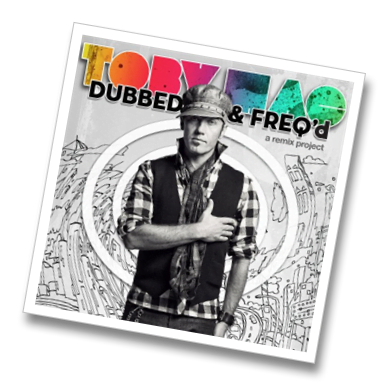 “Dubbed and Freq’d” takes tracks from “Portable Sounds” along with “Tonight” and hands them over to a bunch of folks to work their magic. Kicking off with the classic “Made To Love”, mixed by Telemitry, you’re greeted by the familiar tune that’s become a popular concert anthem coupled with some nifty electronica and, yes, some added D’n’B – but that’s not a bad thing. It’s not overdone, and it doesn’t overpower the track. It’s a fresh twist that cleanses and refreshes the palate ahead of the audio feast that lies ahead. The crowd-bouncer “Showstopper” is given a bit of spit-and-polish, but not as extensive an overhaul as several of the other tracks. It would be great at concerts though, just giving a new and exciting face-lift to really keep the fans on their toes. The first of the big tests comes in track 4, “City On Our Knees”. It took a little while to grow on me as I’m afraid I fall into the “cherish” category with some songs, and yet this is a genius piece of work. Stripped back in many areas, and giving the vocals a real emphasis, this is ideal for a chillout session and also as a bit of a prayer-time backing. Yes there’s the ever-present D’n’B which won’t be to everyones tastes, but for a different twist on prayer music this really would work well – especially with youth or the young adults. Without the vocals of Skillets John Cooper, the Capital Kings remix of “Tonight” probably represents my least favourite of the new mixes. It’s not that it’s bad, or even that it’s different to the original – it’s just lacking the added depth that came with the additional vocals from the Skillet frontman. It’s a good track that deserves its place on the collection, but it is the weakest in my opinion. Add in the original vocals, and return the punch that the original had in the chorus, and I really think this would be a masterpiece. “Boomin'” – a chilled out, laid back version that almost contradicts the “Boomin’ out your stereo system” chorus but works in a really surprising way. “Lose My Soul” kicks off with some sweet piano and is almost a ballad – one to add to a chill playlist! Would I recommend this? Oh Yeah! You can’t go wrong with this. Yeah some of the tracks don’t fully work, but your mileage may vary… at the end of the day this is another cracking remix project and deserves a place on your rotation!